When talking about the quest for adventure and extremes, one should not only think in terms of "no-limits". The Italian category of entrepreneurs includes a group of yuppies whose only creed is challenge. Carlo Cerri is part of this family, so noteworthy and yet, sometimes, so difficult to understand. Last year, we published an advertisement with a brand name on an anonymous marine background; back then, we thought of the renaming of some unfortunate shipyard that wanted to try its luck anew. We were wrong. Cerrimarine, as indicated on the logo, is the result of an investment of money and, above all, of ideas and "love" for the yachting world. The 1997 edition of Genoa Boat Show served as launching pad for this first model that we tested in Rapallo (near Genoa, Italy) - important marina and privileged technical and commercial point of reference of the Cerrimarine yard. The 28' Sport is the first boat of a new generation of motor yachts designed to satisfy the most demanding yachtsmen. We had the chance of sharing the design, evolution and construction of the 28 footer with the yard's gifted and crackling team manager. 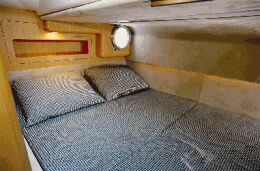 Therefore, we are able to describe the great accuracy of even the smallest detail, from the stainless steel Cerrimarine-designed mooring bitts to the exclusive and patented solutions on deck and belowdecks - the cabin serves as a comfortable shelter with a charming and refined touch. What else can be added? This motor yacht lies between a luxury tender of a maxi-yacht and the family boat that does not go unnoticed. We suggest the reader to discover the personality of this boat by looking at the photographs taken during the sea trials and then to see the boat in Rapallo in order to verify the superb aesthetic and functional detailing that this first Cerrimarine proudly flaunts. This first model is already in the production line in the diesel and gasoline versions confirming the entrepreneurial and international spirit of the new yard. Go for it , Cerri! Light displacement (without engine): 6,622 lbs. Total engines and reduction gears weight: 2x805 lbs. Price with test boat power: Lit. 205,000,000 ex VAT (with 2,270 hp gasoline engine, Lit. 215,000,000; with 2,250 TD engine, Lit. 240,000,000). Helm station: the helm station is located amidships, on a large dashboard. Steering may be carried out while sitting or standing. Surrounding tempered glass windshield is fitted. The instrument dashboard includes engine indicators, Morse-type throttle/reverse lever and personalized steel/wooden wheel. 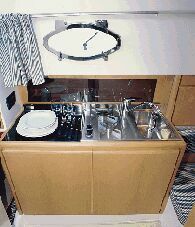 Interiors: fiberglass door on the side of the helm station, galley to port with wooden cabinet, marble worktop and stainless steel sink. 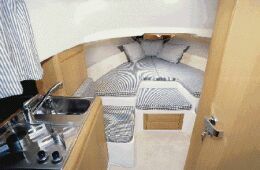 Forward, the dinette can be converted into a double bed cabin with separated bathroom with headroom, electrical toilet and recessed sink with marble top; the double aft cabin is fitted with two lockers and portholes. Upholstery and textiles combine for an elegant interior décor. Deck characteristics and fittings: stainless steel mooring bitts with logo: 2 forward, 2 amidships and 2 aft. Large aft sunning area is obtained by converting the pilot's settee; forward sunning area is fitted with cushion locker at deck level; two access doors connect cockpit to aft swimming platform; wooden grabrails are fitted on the side of the cockpit; integrated aft platform includes with two side lockers and central wooden grid; aft transom is fitted with teak stringer. All steel fitting have personalized logo and are especially made for this model.